Oysters are fascinating. As Jonathan Swift is credited with stating, “It is a bold man that first ate an oyster”. 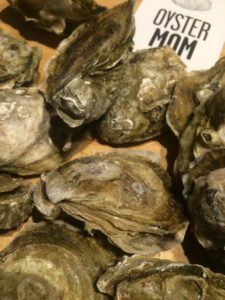 I recently had the privilege of learning a little more about these bivalves as I spent a day with Deborah Keller, also known as OysterMom, on her oyster beds in Oyster Bay near Shell Point, FL. Our mutual friend Quincie Hamby had brought us together to plan a fundraiser to benefit The Survive and Thrive Advocacy Center; a local non-profit that fights human trafficking. Together we planned an event called “Oysters and Pearls” where we served four courses of local oysters: raw, smoked, poached, and fried… we even had chocolate oysters for dessert. While I was in charge of the food, OysterMom brought the bounty of her harvest from the sea and Quincie provided beautiful jewelry inspired by the cause. Though all of the courses were delicious, I have to be honest and admit that my favorite option was the panko fried salad we served before dessert. 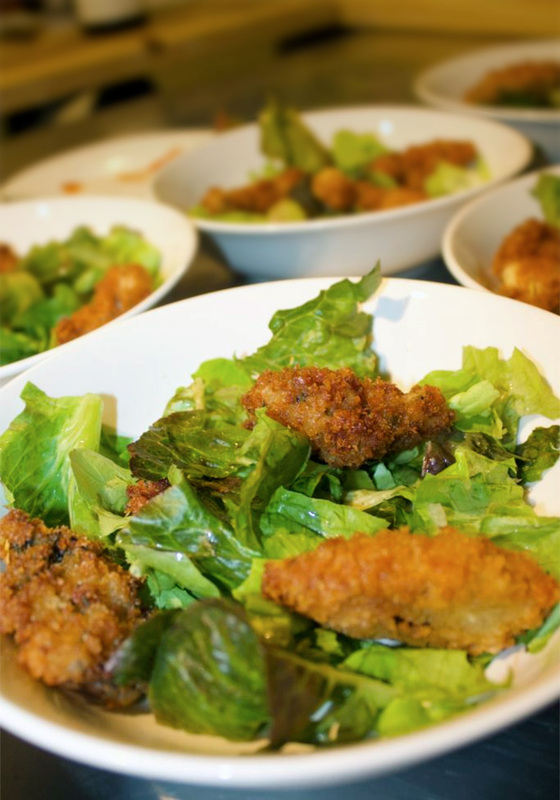 For a salad, once all oysters are fried, serve on a bed of lettuce topped with the Remoulade and fried capers. 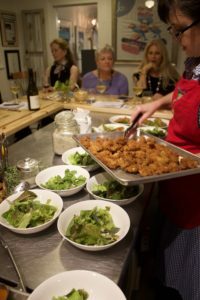 These delicious fried oysters are perfect on their own as an appetizer or main dish or piled on a bed of lettuce with remoulade dressing and fried capers. Check oysters for shells, place in a medium bowl. Stir together Sriracha and milk and pour over oysters, and refrigerate for at least 4 hours. When ready to fry, drain the oysters and reserve the soaking liquid. In a medium bowl whisk together the egg and ¼ cup of the reserved soaking liquid. Place the cornstarch In another bowl, and in a third bowl combine the panko and seasoning. For each oyster, first dip in the cornstarch, shake off excess, dip in egg mixture, drain off excess, then dip in panko, shake off excess, place on platter and refrigerate for about 10 minutes. Heat the oil to 350F. Add a few oysters at a time and cook for about 4 minutes, remove from oil, drain on a cooling rack over brown paper. Yield 1 serving for a fried oyster lover- or 4 if you have some self-control. « Soup to keep you warm!